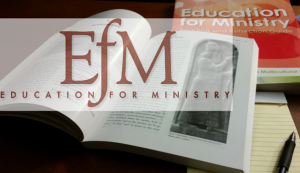 St. Luke’s Episcopal Church in Stephenville, TX is hosting a mentor training September 14-16, 2018 for prospective and continuing mentors in the Education for Ministry (EfM) program, as well as others interested in the program. Please be reminded that Sewanee training requirements for experienced mentors may necessitate your taking basic training. All new mentors must take two Basic trainings before taking a Formation training. To qualify for a Formation training event, a mentor must be active, accredited in a second Basic/In-service, and recommended for Formation by a trainer. Experienced mentors must return to Basic training after 3 consecutive Formation or alternative trainings. Basic In-Service training will equip people to understand the role and responsibility of an EfM Mentor. Those who successfully complete the weekend will be accredited as Mentors by the University of the South. The training is experiential. The aim is to equip you as a recruiter and mentor of an EfM group. Training will begin at 2:00 p.m. on Friday, September 14th. Training will end no later than 3:00 p.m. on Sunday, September 16th. Participants are expected to be present for the entire session in order to meet the training requirements of 18 contact hours. The cost of the training is $200 and includes six meals (Friday dinner through Sunday lunch). The organizers of the training are unable to accommodate special diets, so participants who have special dietary needs can bring their own food and receive a fee credit of $75. The Cottage at Wooded Oaks, a retreat center, has been reserved for lodging. It has 5 bedrooms (16 Twin Beds) and 3 full bathrooms. Sheets and towels are provided. The Cottage is located about 10 minutes from St. Luke’s Episcopal Church in Stephenville. (9020 N. U. S. Highway 377, Stephenville, TX 76401. View a map. The accommodations are semi-private, requiring that you share a room with several other people. The cost is $75 per person per night or $150 for the weekend. This cost is in addition to the $200 registration fee. Holiday Inn Express & Suites, 121 Lockhart St., Stephenville, TX 76401 (1-800-315-2605). For any additional information or questions, please contact Wilson at 817-637-1518 or dana9651@hotmail.com. Directions to location and other training information will be sent by email (or snail mail) to all registered participants.